We are rebranding Newfies-Dialer to become DialerAI to better reflect the aims and objectives of our voice broadcasting and predictive dialer software. 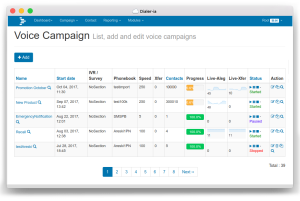 DialerAI is predictive dialer software with voice broadcasting, live lead direct transfer, press-1 campaigns and a host of other features. It’s used by many organisations who want to call thousands or millions of people in a short space of time. We are developing DialerAI to be more versatile in an outbound call centre environment. We have introduced predictive dialing software into the codebase. This was one of our most requested features. Many call centres operate with a mix of voice broadcasting, press-1 transfers and direct live lead transfers. DialerAI aims to be versatile to meet all these requirements. DialerAI works with existing call center PBX systems. It is not necessary to change your expensive call center systems to accommodate DialerAI. Unusually for cloud based predictive dialer software, you are free to choose your own carrier. This gives you the ability to negotiate the best rates for you. The cost of calls is usually the largest expense when auto-dialing. The costs of DialerAI and call costs combined are usually cheaper than many leading all-in-one hosted predictive dialer providers who insist you use their termination. We help new customers set up their systems to interoperate with their chosen carriers and call center equipment. We provide help and support along the way. You can concentrate on your business while we look after the technical side of the predictive dialer software.